Snowboarders will get the opportunity to show off their skills in Easton as part of the Red Bull Butter Cup series, which will be held on February 11, 2012. The snowboarding event is coming to Easton for the second year in a row. The first snowboarding competition, called Drinky's Rail Jam, was held in February this year. A snowboarding trick called a buttercup will have to be completed by the contestants as part of the 2012 Red Bull Butter Cup series, according to David Smith, an Easton-based snowboarder who has been named the event's snowboard director. The 2012 event will feature a longer drop-in of 16 feet, compared with this year's eight feet. Another change to the competition next year is a longer run of nearly 180 feet, almost 50 feet longer than the 2011 event. 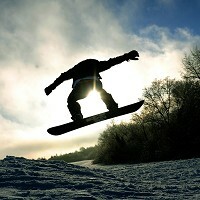 Snowboarders can register their names for the event from 10am on the day of the competition. The competition will begin at 1pm, earlier than the inaugural event. A cash prize will be awarded to the winner of the competition, while snowboarding gear will be distributed to those who get high scores. Holidaymakers planning to head to Easton to take part in the competition need to make sure that they have taken out sports travel insurance cover.